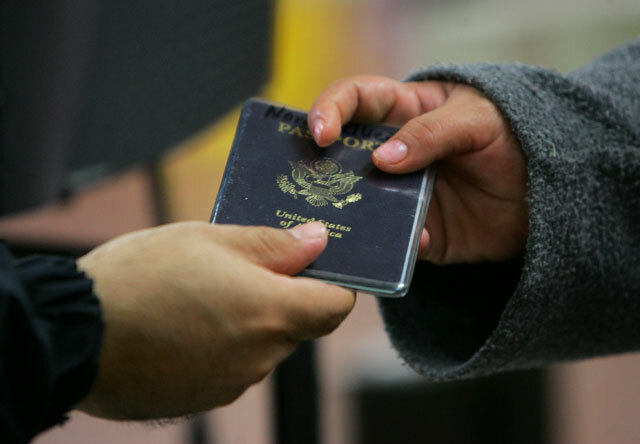 A traveler hands her U.S. Passport to a Customs and Border Protection inspector while returning from Mexico recently at the Hidalgo International Bridge. Two Rio Grande Valley post offices will be hosting passport fairs Saturday, July 21. The McAllen Main Post Office will open its location for passports from 9 a.m. to 2 p.m. at 620 E. Pecan Blvd. The Weslaco Post Office will host its fair from 8 a.m. to 1 p.m. at 109 N. Border Ave.
Customers are encouraged to arrive early, as applicants will be served on a first-come, first-served basis until the applicant maximum capacity has been reached, according to a news release. >> Bring proper proof of American citizenship. This must be either a certified birth certificate issued by the city, county or state; naturalization certificate (a hospital-issued birth certificate alone is not acceptable); consular report of birth abroad; certificate of citizenship; or a previous U.S. passport. >> Each applicant must bring a clear photocopy of their proof of American citizenship that will be pre-sented at the time of passport acceptance. If the document is two sided, then a photocopy of the front and back of the document must be provided. >> Bring proof of identity. This must be either: a previous U.S. passport or passport card; certificate of naturalization with identifiable photo attached; certificate of citizenship with identifiable photo attached; valid driver’s license (not temporary or learner’s permit); Official U.S. military or military dependent identification card; government employee identification card (federal, state, municipal, county); current valid foreign passport. >> Each applicant must bring a clear photocopy of their proof of identity that will be presented at the time of passport acceptance. If the document is two sided, then a photocopy of the front and back of the document must be provided. >> The passport application requires recent color passport photograph of you (2×2 inches in size), which the Post Office Passport Office can provide for $15. >> To save time, customers may download a passport application at www.usps.com/passport to complete beforehand. >> All applicants must appear in person (including minors). >> Minors under the age of 16 must appear with both parents. If one parent is not available, a notarized authorization from the absent parent is required. Each passport for an adult must be accompanied by a check or money order for $110 made payable to the U.S. State Department and a $35 execution fee made payable to Postmaster. Fees for children under 16 are $80 and $35. The cost to expedite processing at the Department of State is $60 paid per application in addition to required fees. The cost to expedite delivery service to the passport processing lockbox is $24.70 per family for Priority Mail Express paid to the United States Postal Service. The cost to expedite delivery service is $15.89 paid per application directly to the Department of State for the delivery of an issued passport book from the Department of State to the customer. This service is only available to mailing addresses within the United States. Not valid for passport cards. Customers can call 1-800-ASK-USPS or go to the Postal Service’s Website www.usps.com to get the location of other nearby passport Post Offices and their passport customer service hours. Passport customers may also check the U.S. State Department’s web site at www.travel.state.gov to obtain additional information.